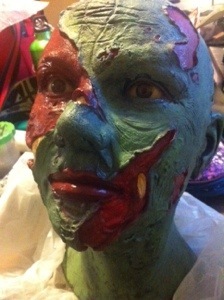 When last I blogged about Halloween, I was working on creating a zombie. And I was, admittedly, following Neil Gaiman’s advice and pretending I was good at it. But a little foreplanning would have served me well. ..but this head was filled with hard foam. 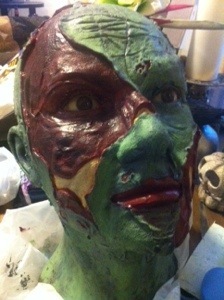 So I had two choices: Try to figure out how to glue the head to the neck – o hai giraffe zombie! – or hollow out the head and slide it over the neck. Foam removal was much easier a concept than it was a reality, and it took me a few hours to remove enough foam to allow easy neck insertion. 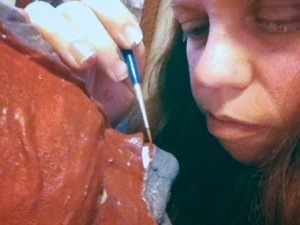 Considering I have another head to work with someday, I am documenting this fact in hopes that I remember to fit head to neck before I do any painting, because the fear of screwing up the mask and the paint job gave an extra level of anxiety to the task of foam removal. As I mentioned previously, the mannequin I was using had a broken foot and couldn’t stand up on her own. While I was fighting with foam, he was creating a platform for our chickie, and rigging up an armature for the arms. 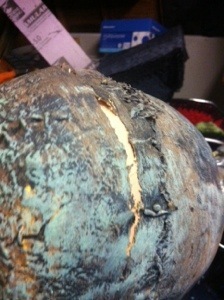 Our gal is a bit more brittle than we’d anticipated, so screwing directly into the body was not Bones’ favourite job. But he is my hero, and he made it work. 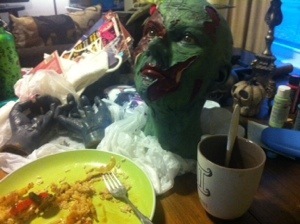 The apron-looking thing is a piece of a zombie costume. I’m not sure how old this thing is, but I love the look of the bones and such. 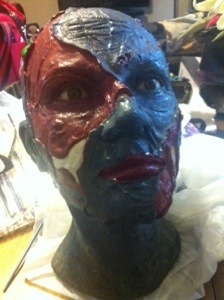 Obviously, it was in need of a repainting to make it match her head…as the next photo shows. 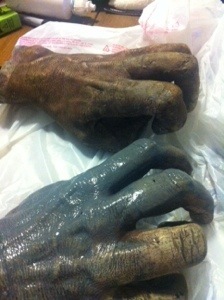 The bits on her arms are from a completely different zombie costume. The look of it is SO different from everything else that I had some serious doubts any of this was going to look like it made any kind of sense. We had left her with only a partial right arm so that I could get her dressed. Sadly, the clothing I had pulled from my costume stash for her just didn’t fit right. My wedding dress was promising, but Bones voiced…um, a loud protest…so I moved on to a blouse created by a Philly designer, Ercoli. The blouse had seen better days, and it allowed me to show off those gorgeous ribs of hers. Hair was stumping me a little. I finally settled on a horribly gaudy red wig I had stashed away. With some black spray paint (I know, I know…tacky as heck) it showed some promise. I slashed her clothing so that we could see her exposed bones and bits, using liquid latex to make the edges icky, and then used more latex mixed with grey powder to give her clothing a further grimy feel. That neck seam is pretty amazingly invisible to me. Also, o hai! 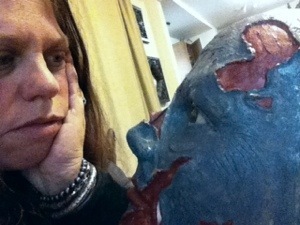 My zombie is a hussy! But I really couldn’t bear to cover up that chest. She ended up being much prettier than she probably should be. I’m still not sure how exactly that happened… Were I to do it again, I’d have lightened up her face, because in haunt lighting her features are a little hard to make out. Alas. Still, for my first attempt, I am beyond happy with her! Earlier this year, Bones was gifted with a mannequin. 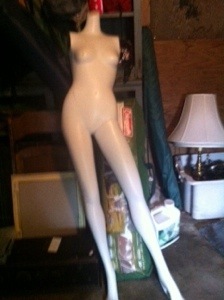 As haunters, we know the rule: When someone asks if you want a mannequin, you say yes!! In reality? Our plastic gal left something to be desired. I’ve been looking at her all summer, seeing very little potential until this week…when I concocted a plan to zombify the lady. First things first! She needs a head. I went through a few bins I affectionately labeled “stuff to make stuff” and realized this head had a foamy inside that should allow me to dig out a neck-sized hole. …but there were a LOT of cracks and tears to fix. So I took a closer look. I’d assumed this head came from a haunt vendor, although I didn’t recognize the work at all. 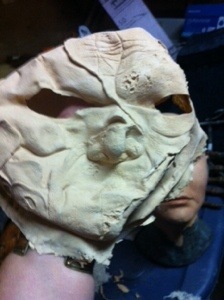 As I poked at the cracks, I realized that in reality this was nothing more than a mask over a mannequinish head. 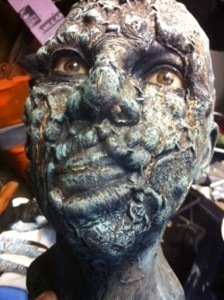 So I took a deep breath and started ripping her face off. 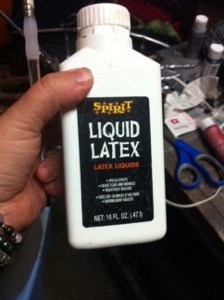 I quickly found that her face had been attached with liquid latex or glue and….straight pins. In other words? 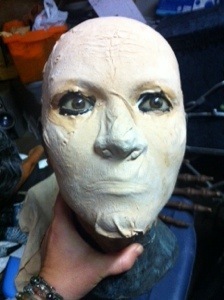 She’s too pretty, even with the folds around her chin and nose where the mask didn’t quite fit as snugly as I wanted. 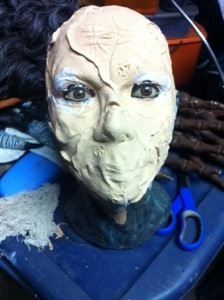 So I did the only logical thing..I tore her face off again and started over. Much better! And this one made for a better, tighter fit, too.All those folds THIS time are actually meant to be there. My first choice was made from a thinner latex which I thought would work better, but having a bit more thickness did help me fit the mask to the face with less air pockets and tearing.